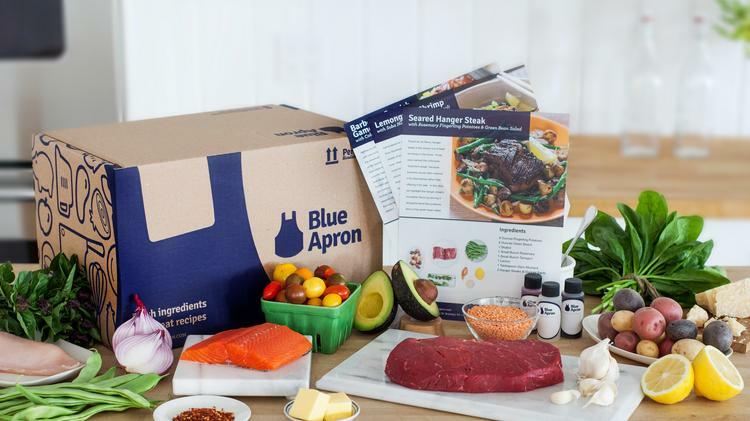 Meal kit provider Blue Apron filed on Thursday to go public in an offering which will test whether it can live up to its $2 billion private valuation. The N.Y.C.-based business could get an edge over numerous competitors in the food and meal delivery industry with a successful offering. It has set a preliminary goal of raising $100 million in the offering. Blue Apron delivers recipes and ingredients to its subscribers. Click here to get the free TechFlash Silicon Valley newsletter. Menlo Park-based Bessemer Venture Partners is the company’s biggest shareholder, with a nearly 24 percent stake. San Francisco-based First Round Capital is the next biggest venture stakeholder, owning about 10.5 percent of its shares. Blue Apron raised nearly $200 million in funding since it was founded in 2012. The filing highlighted the losses and marketing costs of Blue Apron, which has shown signs of stalled growth. Blue Apron’s net loss grew to $54.8 million last year. That’s a 16 percent increase from 2015, according to the New York Times. Earnings before interest, taxes, depreciation and amortization (Ebitda) show a loss of $43.6 million, up 32.5 percent from the year before. Blue Apron’s marketing costs, as well as the rising cost of ingredients and a decreasing number of orders per customer, have also made business tough for the startup. Still, Blue Apron maintains the title of “biggest player” in the sector, despite rising competition from the likes of Plated, also based in New York, and Berlin-based Hello Fresh, which operates stateside. A trio of California purveyors in the meal-delivery space have sprung up as well, including San Francisco-based Sprig; Palo Alto-based Gobble, whose founder we featured in a podcast; and El Segundo-based Chef’d, which has partnered with magazines and Weight Watchers. Maple, another rival, struggled and was eventually scooped up by Deliveroo, a UK-based food delivery company. Rumors of a Blue Apron IPO first sprung up in October, courtesy of Recode. At the time, it was believed that the 4-year-old company would be valued at $3 billion when it finally went public. The company has tapped Goldman Sachs (NYSE: GS), Morgan Stanley (NYSE: MS), Citigroup Inc. (NYSE: C) and Barclays PLC to help with the IPO.